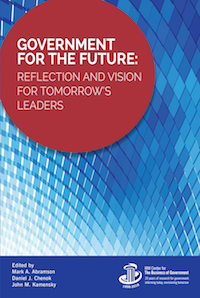 In the IBM Center’s new book, Government For The Future: Reflection and Vision for Tomorrow’ Leaders, part two of the book looks twenty years ahead offering perspectives on the future. This contribution is the next in a multi-part series, Citizen-Driven Government: Boundaryless Organizations, by Sukumar Rao. In 2040, the government will be led by citizens in a network of boundaryless organizations. Citizen leaders will shape and drive government management and operations in a co-creation process that involves public, private and social sector organizations. In this networked world, partners will work together to provide services to fellow citizens and have equal responsibility and account- ability for service delivery; boundaries between institutions will be less critical, and institutions will be interdependent on each other. In 2040, government will be centered around the engaged citizen. Citizens will shape and drive government management and operations. The citizen leader will be skilled in negotiation, facilitation, and collaboration. More impor- tantly, citizen engagement will be proactive—the design and delivery of gov- ernment policies and services will not only be considered a great opportunity, but a valuable credential and experience in a personal and professional career. The level of citizen engagement will vary by the citizen, with different roles based on the level of participation. Disengaged citizens will be incentivized to participate. Building on a citizen’s willingness to contribute, the government will create the right incentives, such as reinforcing a citizen’s ability to make an impact, providing constant training and skill refreshes, and providing incentives. Citizens will lead and own the design and delivery of policies and ser- vices. They will be assigned to lead specific services based on their skills and expertise, and held accountable for their performance. They will recruit team members from a network and form interdisciplinary teams (composed of the public, private, and social sector). This will involve a fundamental change in the identity of citizens: citizens as value creators in a co-creation process working within a network. Co-design will involve citizen participation in the design process, and will be a building component of co-production in which multiple organizations or entities come together to produce desired outcomes. Co-production will involve forming new relationships, improving interactions, and thereby the experience for all participants in the ecosystem—the process of co-creation will often lead to a reconfiguration of roles. Design and delivery of services will focus on finding solutions for citizen problems and needs, based on events and activities in a citizen’s life journey. Services will increasingly span all levels of government (federal, state, local, and international) and will become more seamless and transparent to users. Services will be designed in an iterative process using a user-centric approach to understand what citizens need—developing, experimenting, and testing multiple ideas and prototypes. Services will be designed for different citizen segments and personalized at the individual level using available information about the citizen, without requesting data again—in other words, if the citizen has provided information once to a government entity, that information will persist across all interac- tions and touchpoints. However, this sharing of information does not happen at the cost of privacy—the citizen will have a choice for different privacy levels. Government will proactively communicate with and engage with the citi- zen, using data from all previous interactions with the citizen. Government will use advances in technology, such as deep learning and machine learning, to predict future citizen needs and requests. The government will communicate with the citizen’s virtual assistant about transactions and requested services. In turn, a customer champion will be assigned to each citizen and serve as the primary touchpoint for providing a seamless, personalized citizen experience. The customer champion will orchestrate the delivery of services, performed by partners in the network. In this digital version of the future, the government could be described as a platform for the production and delivery of a range of services and activi- ties that can be mixed and matched.3 By opening this platform to citizen co- producers, government will extend its value chain to stakeholders with the goal of reducing public sector costs and increasing stakeholder satisfaction.4 However, in the future, government will not necessarily build the platform but instead create the conditions to enable it. In 2040, organizational boundaries will blur. First, the network will include public, private, and social sectors as part- ners in the value delivery chain, with equal responsibility and accountability for service delivery. As a baseline, the partners will center around the mission but have varying incentives and motivations. The government will develop and sustain the network to ensure capacity and the best skills. Second, governments will integrate across different levels (federal, state, local, and international) to form a service delivery chain. As described earlier, the focus will be on providing a seamless citizen experience, with boundaries across governments transparent to the user. Based on the service, this inte- gration will happen between and among governments. Third, the future workforce will have vastly more independent and free- lance workers who find work by connecting through peer networks. As a result, far fewer people will work for an organization and, if they do, the type of organization for whom an employee works will not limit their collaboration, resulting in a networked system of boundaryless organizations. Groups of teams and a team of teams, aligned with specific services, will make up the network. The teams will be multi-disciplinary, composed of team members from public, private and non-profit sectors—the best minds brought together to solve the complex problems of 2040. Government operations will be mostly virtual. There will be few formal departments or agencies—but rather networks of teams organized around providing citizen services. Government will enable and facilitate service deliv- ery and ensure the efficiency and quality of services delivered. Government operations will be lean, automated, and driven by artificial intelligence. Data and analytics will be a fundamental component to provide and optimize ser- vice delivery. As a result of all these changes, the future workforce will need different, and evolving, skill sets and attributes. The future workforce will have a set of generalists more focused on areas that require the human touch: engaging customers/ stakeholders, applying context/expertise to problems, managing people and machines. Of course, a critical skill will be the ability to work alongside computers and advanced technologies. The workforce of the future will need to undergo skill refreshes and training before teaming assignments (to obtain the context of their focus problem/area), and a constant re-training and learning of new skills. Watch a video from our event featuring two panels of academics and government leaders as they reflect on 20 years and look forward 20 years in government. Watch the highlights of our event filmed by Government Matters.